I only bet on the horses once a year - at The Grand National. And only on outsiders. If I'm going to win I want to win big. As my bets are based on the names of the horses rather than their form I usually choose names that seem relevant at the time. Because I live on the river I chose River Choice. And Portrait King because I mostly make a living out of painting portraits. The current oil portrait I'm working on has a background full of clouds, so my third bet was on a horse called Many Clouds. Yippee! I bet a fiver each way and won at 33 to 1. Here's part of the unfinished lucky picture. My young friend went down a mine in Bukov the other day. 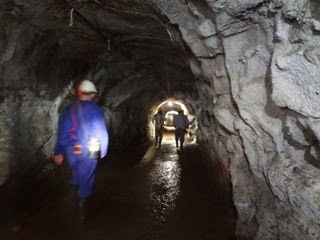 It's a uranium mine in the Czech Republic. She travelled 600 metres down in a tiny lift, then 20 minutes on a little train deep into the mine. She had to wear protective gear including a helmet with a lamp and carried oxygen for emergencies. Sounds scary to me. She and her small group were the only non-miners ever to go there. Here's a view as they emerged. 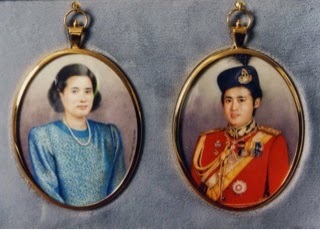 Oh yes, I said I'd tell you what happened when I was commissioned to paint a miniature portrait of the King of Thailand's daughter - HRH Princess Maha Chakri Sirindhorn several years ago. I had been asked to paint a miniature of King Bhumipol Aduladej, which I did, and duly presented it to his daughter at Chitralada Palace in Bangkok. She was intrigued with the painting and asked if I would paint a miniature of her and bring it with me the next time I was visiting Thailand. This I did - based on a photograph with her dressed in military uniform. However about a month before my visit I heard that she had lost over two stone in weight and looked quite a lot different. In a bit of a quandary I rang the King's secretary and asked if he had any up-to-date photographs of HRH for me to see. He sent me a few and I saw that she did indeed look quite different. What should I do? The only solution I could think of was to make a second portrait and house both of them together in a nice silk and leather case. When the audience at the Palace became due I was a bit apprehensive as four or five television cameras were present (as always with any Royal event in Thailand). Her reaction, when I presented the miniature portraits to her, was to let out a loud laugh and to call her ladies-in-waiting to see the miniatures. "See", she said "Before, and after". She did like the miniatures and my audience lasted over twenty minutes. At one stage she told me that she broke her diet many times by sneaking down to the fridge in the kitchen to help with her 'night starvation'. A really gracious young lady and loved by everyone in Thailand. The other day my young friend and I went to the cinema to see Cinderella. 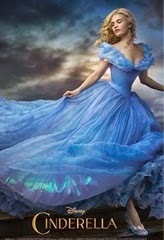 It may be a children's film but I thoroughly enjoyed it. Great CGI effects and good characterisation. You leave the cinema feeling happy. On Thursday I took my artistic friend's wife up to Stafford to visit him in gaol. We took a collapsible wheelchair with us as she is very frail and can't walk more than a few steps. Whoever designed that wheelchair made a rotten job of it as without help it's impossible to push it over any obstruction more than an inch high. But we managed. Not knowing the visitors system it took us nearly two hours to finally enter the prison itself. So many big doors, chains and many layers of security. I had to be stamped on my hand with an invisible ultra violet device - this to avoid male visitors changing places with inmates. 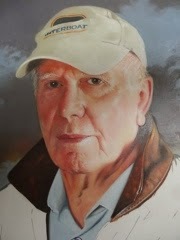 My friend looked good and told us he has finally been allowed to paint.